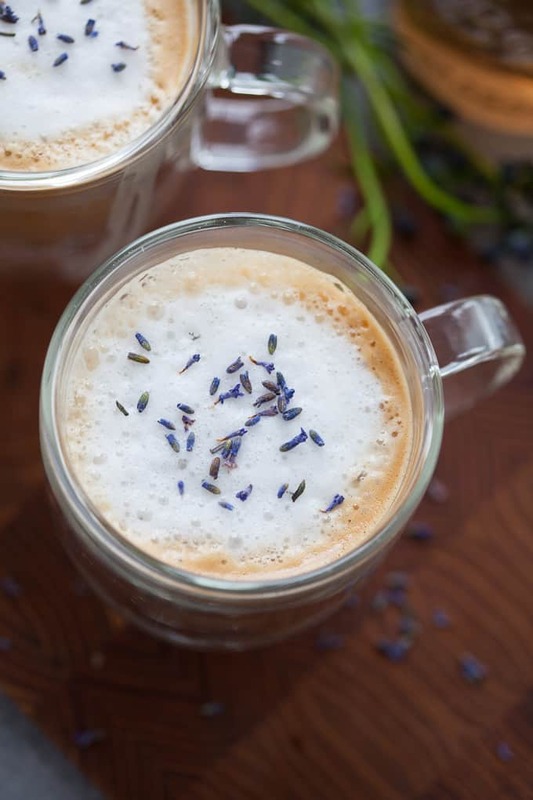 Warm, grounding and totally cozy, this lavender latte made with Almondmilk is perfect for a slow morning or when you just need a peaceful moment to yourself. This post is sponsored by Blue Diamond Almond Breeze. Thanks for supporting the brands that make TFD possible and, as always, opinions are my own! 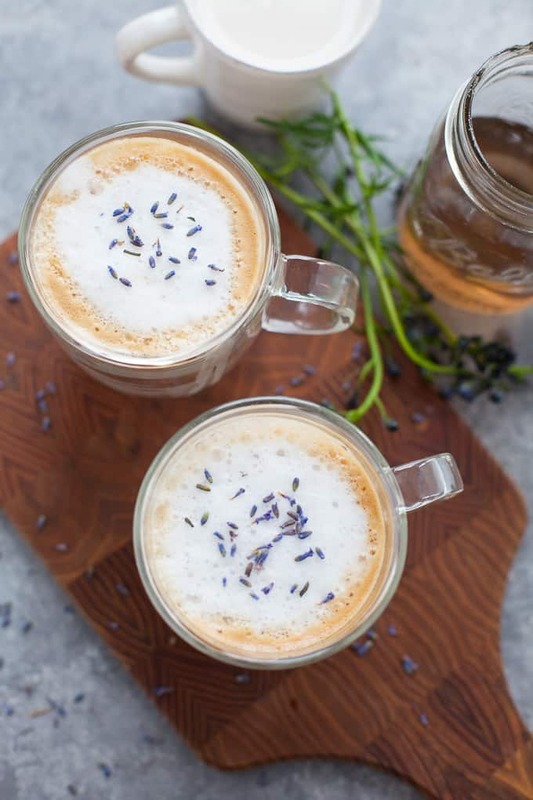 Currently curled up in my comfy chair with a bulky sweater on and sipping on my lavender almondmilk latte as I write this post. Doesn’t get much cozier than this. few odes to tea on this blog because I’m an avid tea drinker but what you may not know about me is that I’m a sucker for a mid-afternoon latte. I really do love the taste of coffee. Even more so, I love the haunting aroma of coffee. But coffee hasn’t always loved me back. As someone with a sensitive stomach, coffee doesn’t always agree with me. But I find if I have espresso with non-dairy milk, I seem to do just fine. A latte around 2 or 3pm is just what I need to rally for the remainder of the work day. And I also love a latte on a cozy weekend when I’m curled up with a good book. 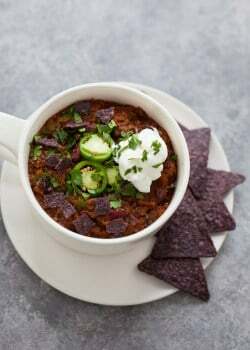 Being a food blogger, I like to keep up on the latest food trends so I can infuse them into my recipes here and write about them in articles in the media. One of the food trends highlighted for 2018 is florals. You might be like what does florals have to do with food?! Well, besides using edible flowers as pretty garnishes, chefs are starting to use more floral flavors like lavender and hibiscus in recipes like cocktails, baked goods, ice creams, puddings and even meats. And I don’t know about you but I luuuurve me some lavender. Most nights (especially if I’m feeling stressed or anxious), I’m rubbing some lavender essential oil on my temples or diffusing it into the bedroom. The smell of lavender is SO relaxing to me. In fact, some studies show a correlation between lavender oil and improved sleep quality. 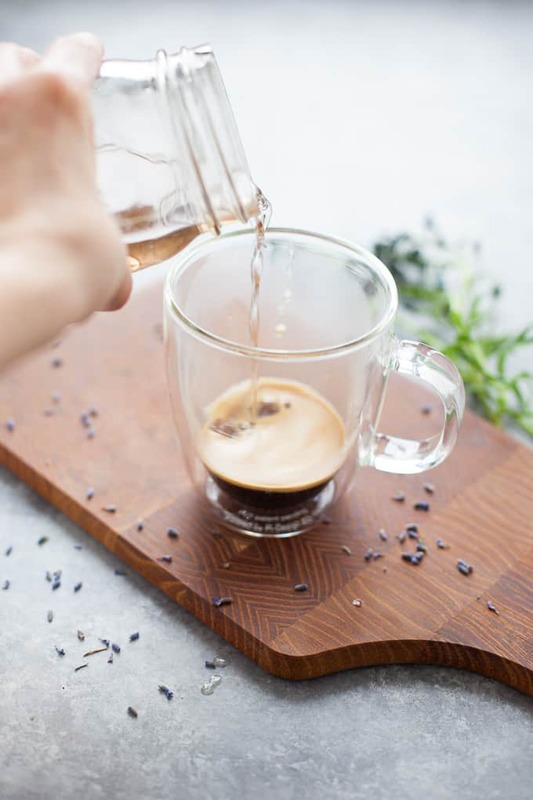 Now adding culinary dried lavender to your latte (or any recipe for that matter) probably won’t have the same effect but it still tastes and smells amazing. And there’s something really cozy about recipes that call for lavender. Like this latte – SO. COZY. 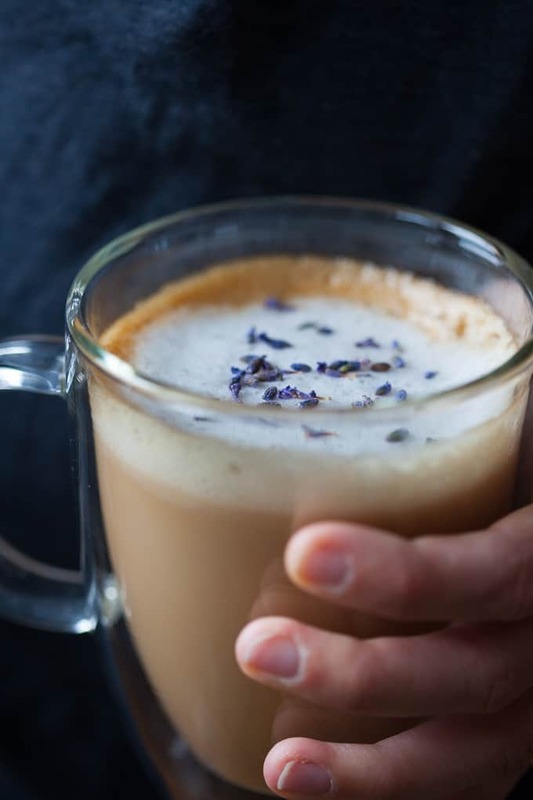 Now you can make this latte with regular milk or any non-dairy milk but I chose to make it with Almond Breeze Almondmilk because I love the taste – it has a creamy, smooth texture and hint of almond taste. Plus, it’s an excellent source of calcium (45% of your daily value! ), vitamin D and vitamin E and a good source of vitamin A.
I also care about the company and the people behind the brands that I choose. I recently had the pleasure of meeting the folks behind Almond Breeze in Sacramento, California and got to meet some of the almond farmers who produce the almonds for Almond Breeze. One thing that I was surprised to learn is that Blue Diamond (the company that makes Almond Breeze) is truly a family-owned business. They’re a co-op of more than 3,000 family almond growers in California. 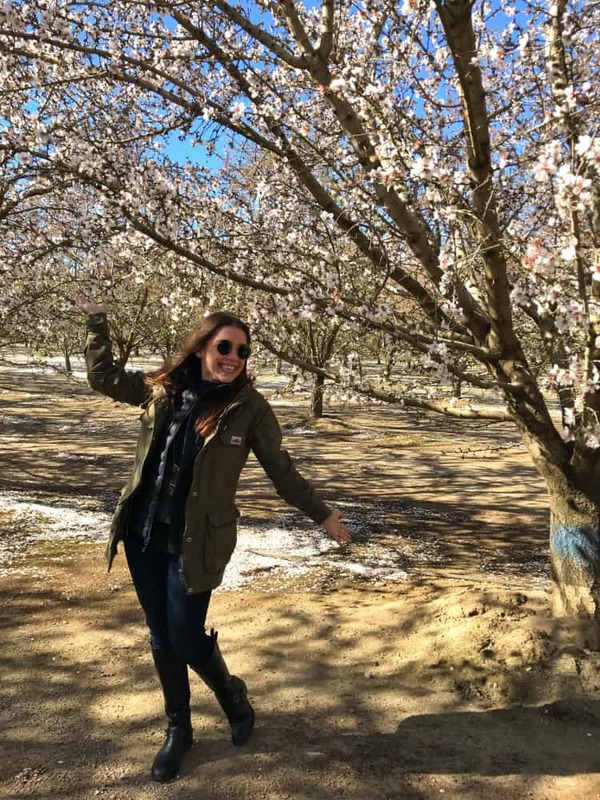 I have so much more pride in choosing Almond Breeze now having visited the almond orchards and seeing all of the tireless work that these farmers go through to harvest their crop and knowing that my purchase is helping to support these farmers. Plus, that almond milk foam was looking MIGHTY FINE in my latte. I was worried it wouldn’t foam as nicely as regular milk but it sure did. 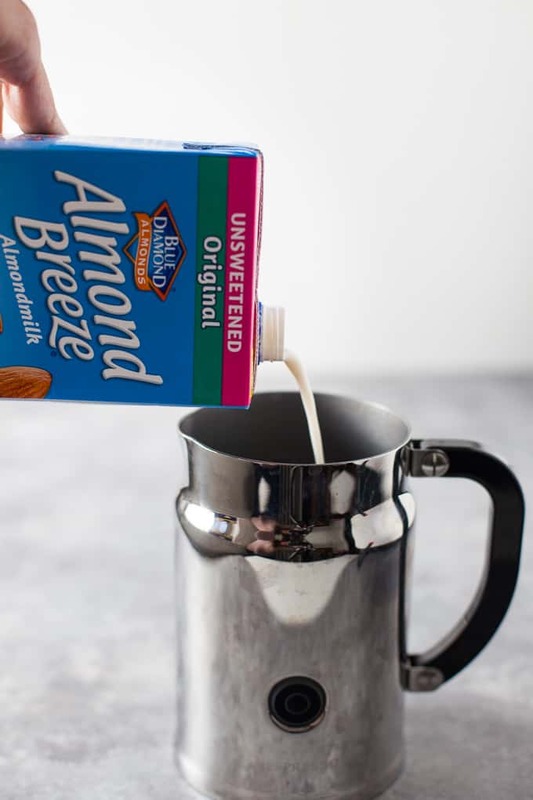 Almond Breeze isn’t just for lattes though, you can use it in your everyday cooking too – think soups, baked goods, savory sauces and desserts. I used the Unsweetened Original Almond Breeze for this recipe but was thinking it would be really delicious made with their Unsweetened Vanilla OR their Almond Cashew Blend, which tastes even creamier, and is available in Unsweetened Original and Unsweetened Vanilla as well. You can find Almond Breeze in both the chilled/refrigerated and middle aisles/shelf stable sections of the grocery store. Enjoy this cozy latte as we brave the last of these late winter temps and start approaching spring! Floral flavors always make me think of springtime temps and blooms. Get exciteddddd! In a small saucepan, bring water, sugar and dried lavender to boil over medium-high heat. Reduce heat to low and let simmer for 3 minutes. Remove from heat and let cool to room temperature. Using a fine mesh sieve, strain syrup, discarding lavender solids. Steam almondmilk over the stove top or in the microwave or froth it using a Milk Frother. 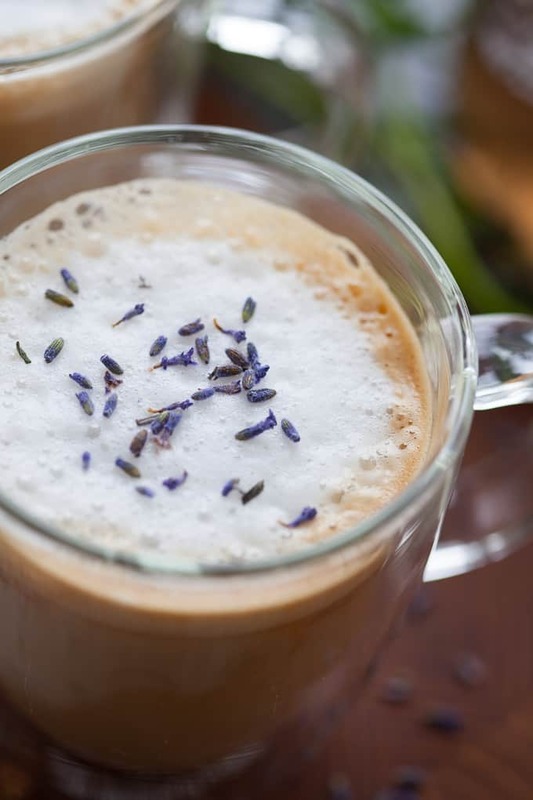 In a mug, add espresso, stir in lavender syrup, and pour almondmilk over top. Enjoy hot. 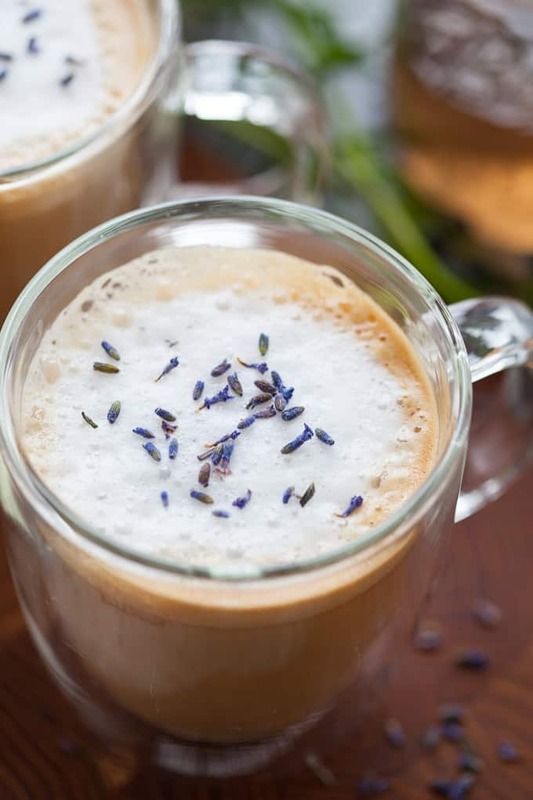 *You can reduce the syrup to 1 1/2 tablespoons per latte if you like your coffee drinks subtly sweet but I wouldn’t reduce it less than that (I tested it with 1 tablespoon and couldn’t detect the lavender taste). 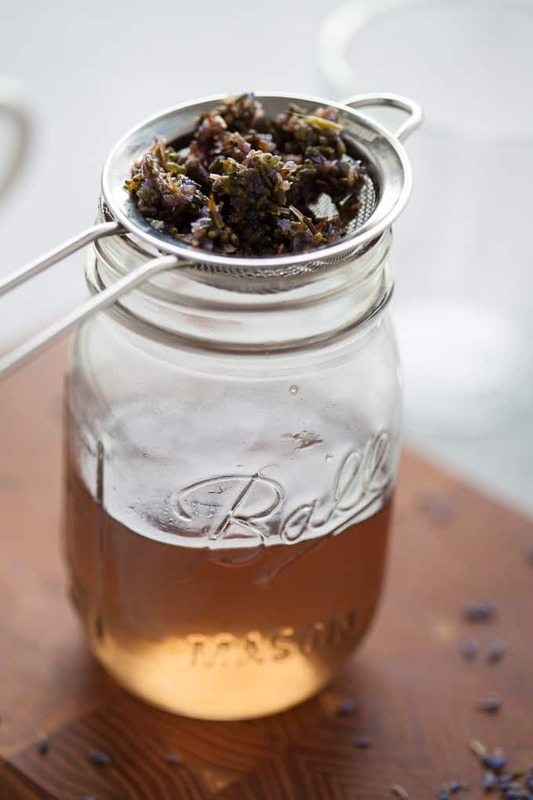 Tell me, have you ever tried using lavender in your recipes? Are you a fan of almondmilk? 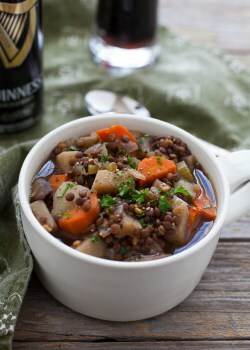 Looking for more recipes to ride out the last of these chilly winter days? 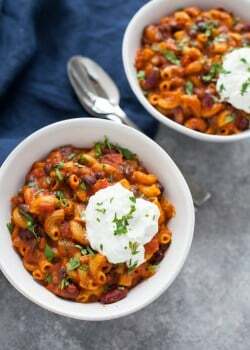 Check out a few of my favorite cozy + comforting dishes below! I love how there are so many different ideas for healthier hot drinks nowadays. It’s so much nicer than the options just being coffee or tea. Your recipe is a great example, especially with the inclusion of lavender. This is such a comforting and cozy drink! Can’t wait to try it out and I do love the creamy taste of Almond Breeze Almond Milk! Thanks, Shannon! Glad to hear you’re a fan of Almond Breeze too! Pinned. This puts me in a calmer state of mind just seeing it. Lovely. Love hearing that! Thanks, Marisa. 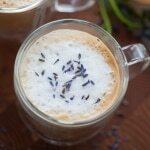 i love lavender latte too but never thought of making it at home. i am sooo going to try this. Thanks, Dixya! So glad to hear that you enjoyed it! I love lavender! This looks like such a cozy and comforting beverage!